a few issues with the manual. 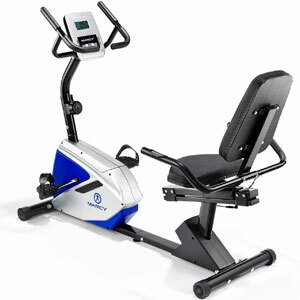 Those in need of a gentle, comfortable session could get along well with this Marcy Azure RB1016 stationary bike. 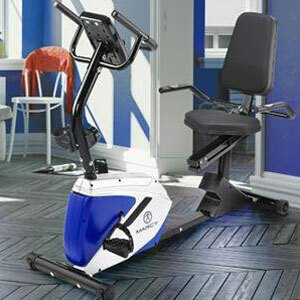 This is a recumbent exercise bike that promises ease of use for all those that want a good workout. This comes from the both the physical accessibility of the machine and the one-button console. The recumbent seat is adjustable to suit the height and posture of the user. There is also a simple step-through frame and the use of stability handrails for added security. Therefore, no need for older or disabled users to climb into the seat or worry about falling. The sense of comfort continues with the padding, tablet stand for mobile devices and the water bottle holder. The seat is larger than some other machines, and comfortably supports those up to 17 stone. 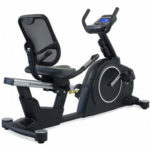 Comfort is important with this sort of gym bike, but users also need to know that they can achieve a good workout. This Marcy exercise bike uses magnetic resistance and a 4kg flywheel for a smooth ride with some room to progress. That console also displays information on basic data about the session. The problem with this Marcy Azure RB1016 Recumbent Exercise Bike is that it can only go so far with the programmes and workout. The reason that the sales pitches focus on the comfort and design here is that there isn’t much to talk about with the workout. Users can’t do much else than change between those 8 resistance levels, and the 4kg flywheel isn’t the toughest around. This means the same sort of workout everyday – which might not always work for the liberation and motivation they promised. There are also some people that feel that the user manual could be a little better with this novice demographic in mind. Is this Marcy RB1016 Bike still recommendable with this feedback in mind? There are limitations to this machine, but at least the makers don’t try and pretend that it can do more than is actually possible. The focus on the comfort and design is honest and understandable. Users won’t get an intense, diverse workout here, and there is no oversold promise that they will. Instead, they get a smooth, reliable motion from a machine that is pleasingly accessible to larger, less-able and novice users. This Marcy exercise bike is a no-thrills entry-level model that will suit a lot of people. Find more reviews about the Marcy Azure RB1016 Recumbent Exercise Bike on Amazon here.